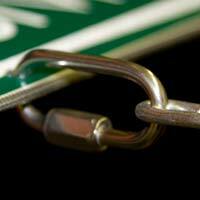 We have three sizes of stainless steel quick links. 4mm wire diameter with overall length of 40mm and 8mm wire diameter with overall length of 75mm. The smaller size suits most of our signs.